This is a picture of me and Gilbert Arenas grilling. 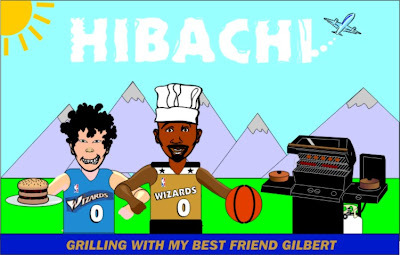 I entered it into the Hibachi contest on the Wizards Web Site. Man what a fun time me & Gilbert had in the Blue Ridge mountains. We grilled food all day long and played one on one. We frolicked in the fields and rode a bicycle built for two. He told me I was his best friend ever. Then we had a park ranger take this photo to commemorate our fun time. I even had a friend of mine write Hibachi in the sky with his plane. Gilbert is my BFF 4evz.